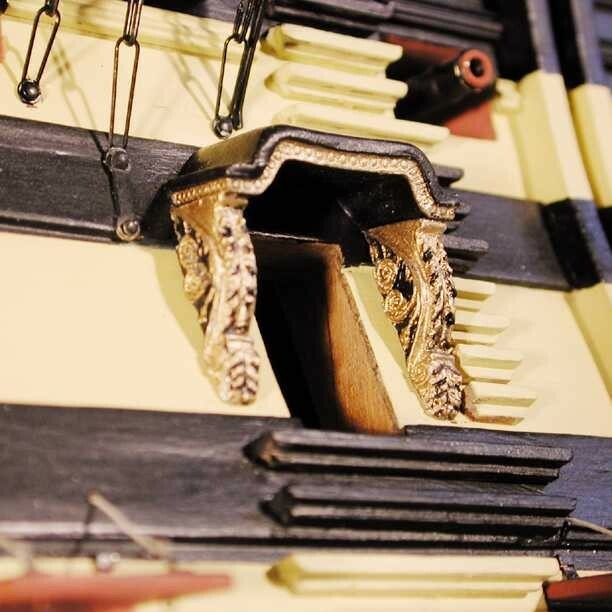 Caldercrafts wooden model kit of the HMS Victory contains double plank on bulkhead construction in lime and walnut, complete with pre-cut gunport strips ~ no more need to tediously mark on and cut out the gunports yourself; 5 different sizes of turned brass cannons; Carronades; 8 sheets of brass etched components; 3 different profiled brass rails; CNC cut walnut and ply components, profiled where necessary; All new scale turned wood belaying pins, support pillars and staircase balusters; All necessary blocks and black / natural hemp for rigging; All 4 ships boats in authentic plank on bulkhead construction; All new scale copper plates. 18 sheets of fully detailed actual size plans and a comprehensive, full colour, step-by-step instruction manual including constructional photos of the prototype. All this enables you to build the most authentic model of H.M.S. Victory as she appeared at Trafalgar. As well as this, the kit also includes the timber work to produce the model to the current specifications as she stands in Portsmouth, for example timberheads, capping and hammock cranes for the forecastle. 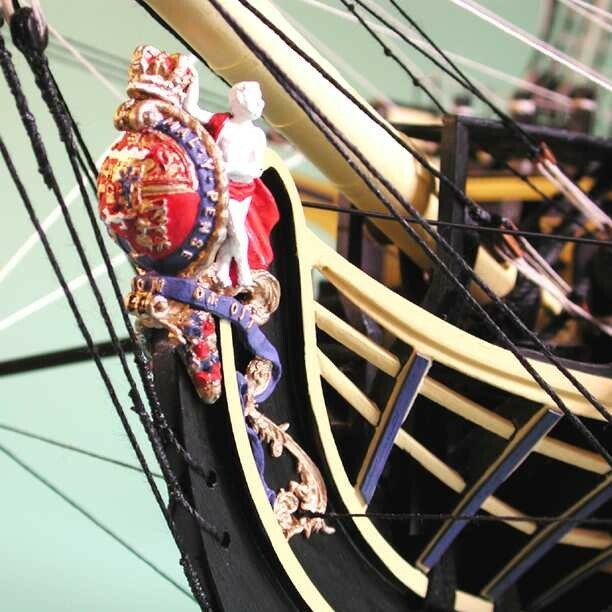 After more than two years of extensive research and development, using information and sources previously unavailable, this is the most historically accurate, highly detailed kit of Victory in her Trafalgar condition available. Our model is very different to other manufacturers, and the amendments are the result of our own research verified by Mr. Peter Goodwin, and further research provided by Mr. Goodwin. Forever associated with Nelson's last battle, H.M.S. Victory is one of the most famous ships of all time, and is now preserved as a major part of the Royal Naval Museum in Portsmouth. The ship's survival is particularly appropriate since Victory is not only an example of the ultimate sailing warship ~ the three decker First Rate ~ but she was also the most popular and successful 100-Gun ship of the period. Forty years old by the time of Trafalgar (1805), she had been the flagship of half a dozen Admirals, and was to continue in active service until 1812. 1. The first Victory was built in 1559. In 1586, she was rebuilt to 800 tons and carried 34 guns with a crew of 750. At the defeat of the Spanish Armada in 1588, she was the flagship of Sir John Hawkins. 2. Phineas Pett designed the second Victory. She was built at Deptford and launched in 1620. Rebuilt in 1666 to 1029 tons and carried 42 guns and a crew of 500. 3. The Royal James of 1675 was renamed the third Victory in 1691. 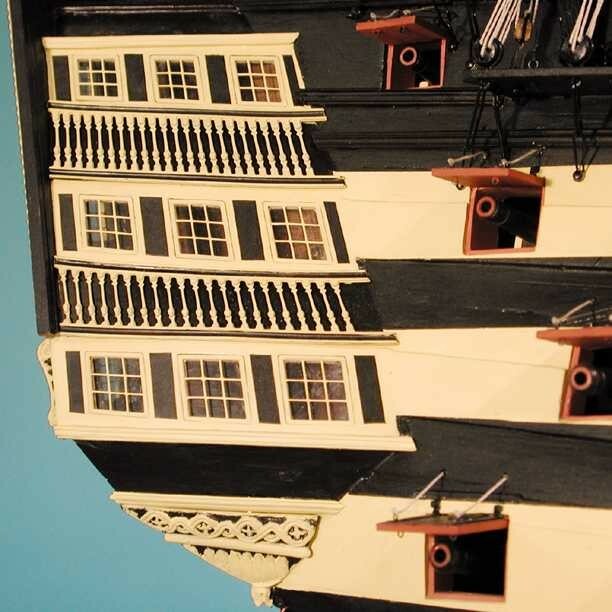 She was rebuilt in 1695 to 1486 tons and carried 100 guns and a crew of 754. 4. The fourth Victory suffered a tragic fate. Launched in 1737, she was of 1920 tons, carried 100 guns and had a crew of 900. She was lost during a gale while off the Casquets in October 1744. Her whole crew perished with her ~ this tragedy caused the name Victory to be deleted, temporarily, from the Admiralty's list of ship names. 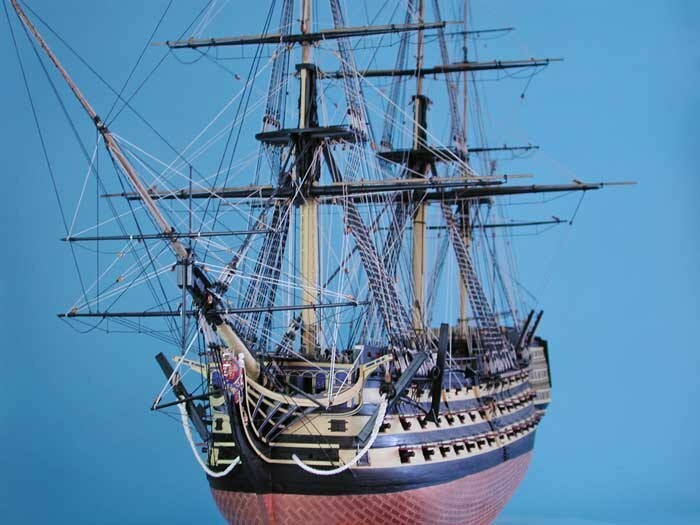 This, the fifth Victory, was one of twelve ships ordered by the Navy Board on June 6th 1759 ~ more than 40 years before the battle of Trafalgar for which she is famed. Designed by Sir Thomas Slade, construction began at Chatham Dockyard on July 23rd 1759, the 'marvelous year' (Annus Mirabilis). This, the year of victories, marked the turning point of the 'seven years war' for Britain. 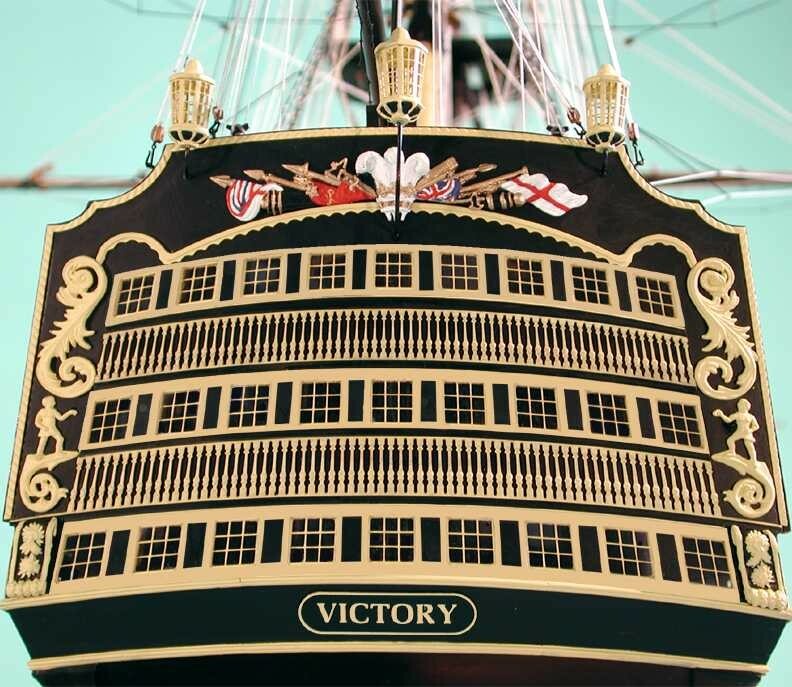 These facts may well have played a significant part in the naming of the vessel and the name Victory being restored to the Admiralty list of ships.